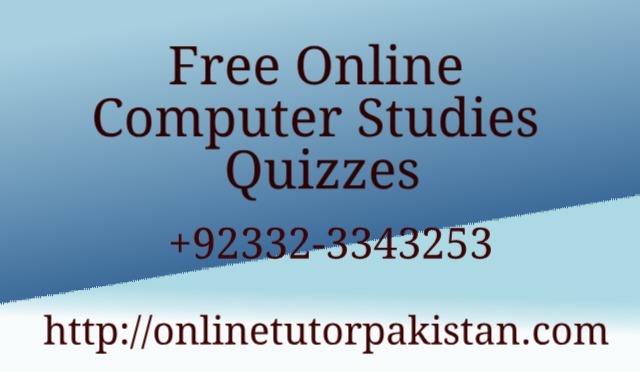 Free Online Computer Studies Quizzes - Online Tutor Pakistan, Online Tuition Karachi Pakistan, +92332-3343253 Skype id: ascc576, Online tuition Tutors Pakistan, Saudi Arabia ,Online Tutor Academy Pakistan Qatar, Kuwait, Saudi Arabia, USA, UK, Canada, Australia, Karachi Lahore Islamabad, Online Maths Physics Stats Tutor Karachi Pakistan, Online Tuition Pakistan,Online Tuition Pakistan, Online tuition in Karachi, Pakistani tutors, online tutors in Pakistan, Karachi tutoring, Online tutoring, Online math tutor Pakistan, Online Physics Tutor Pakistan, Online Teacher Pakistan, Online Chemistry Tutor Pakistan, Online Biology Tutor Pakistan, Online Economics Tutor Pakistan, Online tutor Accounts Pakistan. Free online Computer Studies Quizzes for ninth class, O level, Federal board curriculum. Online Tuition Pakistan provides best online quizzes for complete and comprehensive study for your exams. quizzes includes topics covering Karachi Board, Federal Board and O level curriculum. Al-Saudia Virtual Academy, Online Tutor Pakistan renowned for its support for students of all curriculum. We offer online tutoring for Math, Physics, Chemistry, Biology, Stats and other subjects.